USER SCORE:78%The percentage of users who liked this based on high quality reviews from sources such as Google Play, iTunes, and Amazon Music. Above 75% is green. ? 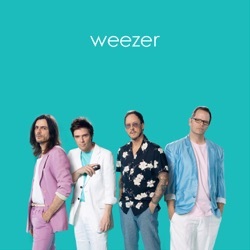 Weezer (Teal Album) is the 12th studio album by Weezer, released by Crush Music through Atlantic and Warner Music on January 24, 2019. So, yes, The Teal Album’s existence is sort of a fluke, but here’s one last fact for you: It rules. Weezer is finally dead (to me at least). The Teal Album is kind of really good. As someone who's spent four days listening to it, I can assure you it does not reveal its charm over time. Harmless, serviceable, and at times, a good amount of fun. Based on its contents, from its list of popular cover choices, and the conventional visions for recreating those songs, "The Teal Album" is an endeavor that can only be adequate at best. On The Teal Album, Weezer delivers an outright hilarious choice of ten faithfully-executed classics for an overall colourful experience. Truly remarkable in its arrangement and its delivery, Weezer‘s ‘Teal Album’ is an enjoyable album, provided you don’t take it too seriously. Basically, if you’ve heard the original, then congratulations, you’ve heard the Weezer cover. They honor the wildly disparate likes of “Billie Jean,” “Paranoid,” and “No Scrubs” so faithfully it raises the question of what we as listeners are meant to need of them. If Weezer expressed interest in playing my wedding, but they would only play cover songs (no Weezer originals), I’d lock them down in an instant – with, or without my fianceé’s approval. In spite of all the possible pitfalls Weezer could have faced in its delivery, The Teal Album is a truly pleasant surprise, and one of the most likeable records to have emerged in recent months. Each track is instrumentally scarcely distinguishable from its original, a separate spin is completely false except for a few additional six-string audio tracks. It sounds more like the dying gasps of a band clambering for any amount of relevance they can still get. Weezer here is a live karaoke band running faithful cover versions through some sort of musical meme machine to create, probably, the exact sort of thing the Fyre Festival attendees thought they might have been getting. The record's enjoyable in the same way a pub's covers band is enjoyable after you've downed a few drinks. You gain nothing from listening to this, even if you’re just looking to rant about something. It’s like live band karaoke, and everyone is invited, which is all this really boils down to at the end of the day. Weezer (The Teal Album) actually works. Weezer is a very capable band doing some very good covers. It looks like Weezer is saving the industry and making rock and roll great again, not by building walls, but by breaking 'em down. Weezer’s album is more than just a fun nostalgia trip for fans; it’s also clever stealth promo for the band’s upcoming March release, The Black Album. You can mock the entire concept of a Weezer covers album, but not the tribute band fidelity of what they achieve. The Teal Album is a cheap gimmick that never rises to anything more than a recording of your average wedding band. The Teal Album is fun. It showcases Rivers’ great voice and the band’s constant versatility and dexterity. Whereby Weezer only add an electric guitar track here and there, otherwise they are embarrassingly fixated on faithful work, Cuomo even adapts his singing style to the originals. Like a gin and tonic without the gin. The Teal Album is an amusing surprise for Weezer to drop, but it also feels like a misuse of their charm packaged into a cash-grab. This will be an album for which the novelty wears out incredibly fast, and as much as that might have been the intention, it’s not a good foundation to build an entire album on, regardless of how throwaway it is. Weezer smartly approach covering some of the most iconic songs of the past with a deft ‘if it ain’t broke’ touch. WEEZER are enjoying themselves, and the joy is quite simply infectious. The lifelessness of the covers ensures that it has a shelf life that isn’t much longer than your average meme. It doesn’t even pass as a joke album – they’re just straight-ahead paint-by-numbers covers, like something a wedding band might play. Is there ever a time when I'd rather hear Weezer (or anybody else) cover "No Scrubs" instead of TLC? Unless I'm singing it at karaoke, absolutely not. Teal’s focus on joke covers of big ’80s hits feels like a missed opportunity to teach the listener more about the band’s beginnings. When Weezer find a jokey gimmick that works, their desperation for a hit leads them to become the punchline themselves. A record of 10 gratingly bad cover songs originating from 1967 to 1999 that have no tangible thematic cohesion other than Weezer felt like covering them. ‘The Teal Album’ at once satirises the covers album and makes a decent stab at perfecting it. Best Cover Album EVER! I had no idea this was coming out and this has totally made my week. I immediately linked all my friends to the album They managed to pick some of my all time favorite songs from the 80's and they did them such justice. Great album, not a bad song in the bunch. Pure classics! I will have this on repeat for a very long time to come. I have beena fan since the Blue album came out and this was such a great treat. Thanks! files were mastered WAY too hot! I was looking forward to this, but the sound quality here, on Apple Music, Spotify, everywhere, is horrible. The files were mastered way way way too hot. Most of the tracks distort terribly. Somebody really messed this up and I hope they replace these. Generic and boring. What’s the point of doing a cover song, if it sounds exactly like the original? The entire album was recorded and mixed very well - but so uncreative. Come on An entire album of covers that sound exactly like the original, kind of lazy.